Living in Catalonia and having access to basically unlimited amount of climbing is, as you can imagine, just amazing. One cool thing is that we very seldom go to famous areas and sectors. Instead we focus on smaller crags and areas that most of the time can’t be found in guidebooks and even less seldom see any foreign visitors. The quality of the climbing in these areas are most of the time amazing. Perles, for example, has some of the coolest routes I’ve ever tried. I will from now on try to write a few words about the crags and sectors we visit. Maybe it can guide some of you to good climbing experiences? We don’t climb very hard, normally we look for 6a to 7b+, making our selection of crags interesting for many of you. La Pauta is close to Vilanova de Meia and is included in the guidebook for that area. Now the crag has been rebolted, new routes opened and a new topo published on some blogs. Saturday we headed there to try it out. From Barcelona it’s about 2 hours drive. The location is second to none, very beautiful on a high plateau. The routes are generally quite long, around 30-35 meters. The climbing is either vertical/slabby on bullet grey limestone or a little steeper on orange limestone. The orange rock is a little less solid but no big problem. It’s a good crag for groups of people with a wide range of grades, there is 6c next to 8b. 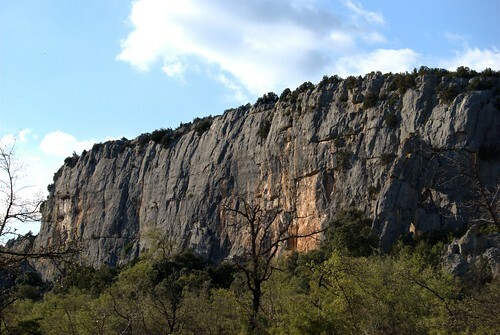 We tried a some routes from 6a+ to 7a and the verdict is: excellent climbing and stiff grades! I aimed for two rather long routes with cracks, Crackers and Alvalle del Gaspatxo, two excellent routes. Crackers truly gives a full value climbing experience. So what is the verdict? Well, living next to Montserrat means that I have basically endless of slab climbing close to my house. When I drive somewhere to climb I want a different climbing experience. I really enjoyed the routes that we did but I prefer going to a place with for example steeper climbs when I go for a drive. Montgrony for example is a big favorite. Still, I don’t think you can be disappointed by your visit to La Pauta. Desde Artesa de Segre anem fins a Baldomà, i allí agafem la carretera a CLUA durant 4.6 km. No cal arribar a Clua. Al km. 4.6 hi ha un desviament cap a l’esquerra per una pista en bon estat (cartell verd, Vall d’Ariet) que cal seguir durant 2.6 km. Parking evident en una corba molt ampla. 5 minuts planejant fins al peu de paret. From Artesa de Segre going to Baldomà, and there take the road for 4.6 km towards Clua. After 4.6 km you take a left turn along a dirt road in good condition (green sign saying Vall d’Ariet) that you follow for 2.6 km. Parking is obvious in a very broad curve. 5 minutes walk from parking to wall. Facing south, sun all day. Muchas gracias por el enlace y el amable comentario, que además me ha permitido descubrir tu blog que es muy, muy bueno. Felicidades.